Side judge Rob Vernatchi has been suspended for one game with pay for failing to notice or correct a running clock after a touchback, a mistake that ultimately ran 18 seconds off the clock before the Steelers’ game-winning drive. The actual error was the clock operator’s—a local hired on a game-by-game basis by the league, and who will likely not be hired again—but the officiating manual puts the oversight of the clock right on the side judge. The NFL acknowledged the error in a statement on Tuesday, which echoes the officiating manual in noting that while it was the side judge’s job, any member of the officiating crew could have corrected the clock. Expect Pete Morelli’s crew to suffer in their game grades, which determine postseason assignments. The suspension of an official is a rare thing in the NFL. 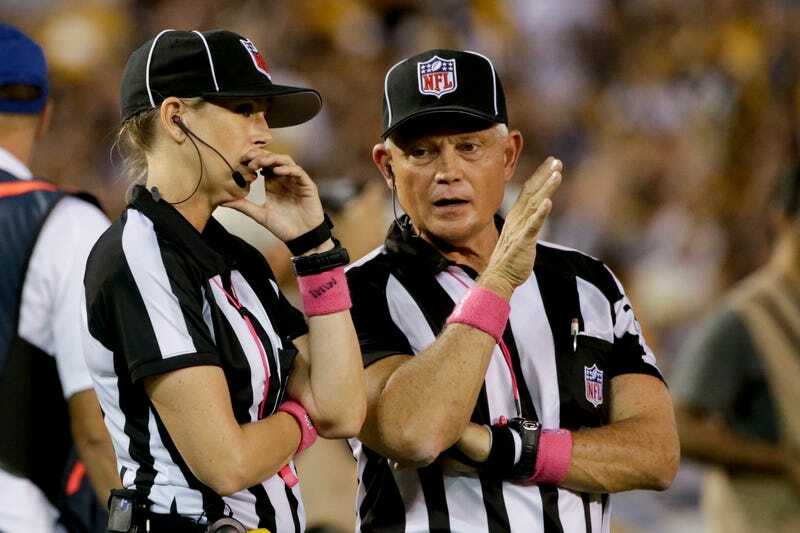 Football Zebras, which would know better than anyone, knows of only six previous incidents—only four of them for actual officiating fuckups.